Russian healthcare marked a major milestone on Wednesday with the opening of the branch of a top Israeli hospital at the Skolkovo innovation centre, meaning Russians can now access Israeli healthcare without having to leave the country. 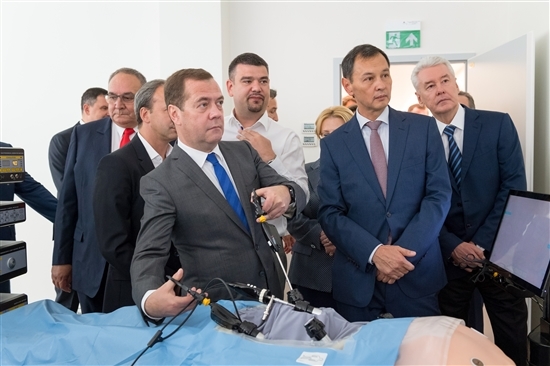 Prime Minister Dmitry Medvedev tries his hand at a surgery training simulator made by Skolkovo Foundation resident Eidos-Medicine at the Hadassah clinic inside the MMMK on September 1. Photo: Sk.ru. Hadassah, a renowned Jerusalem hospital, is the first foreign medical centre to be able to operate in Russia without its doctors being required to requalify under Russian law: an exception made possible by the special legal status of the Skolkovo innovations city. 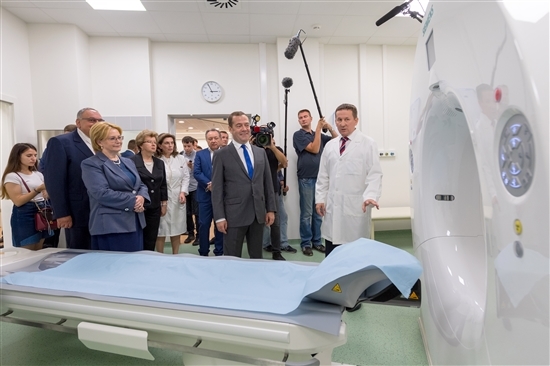 The state-of-the-art clinic is the first to open within the Moscow International Medical Cluster (MMMK), which was visited by Prime Minister Dmitry Medvedev during his visit to Skolkovo on September 1 and officially opened by Moscow Mayor Sergei Sobyanin four days later. “This is a major event, both for the city of Moscow and for medicine,” said Sobyanin at the opening of Hadassah Medical Skolkovo. The first building of the Moscow International Medical Cluster was built using investment from the city of Moscow, and hosts a diagnosis centre run by Israel's renowned Hadassah hospital. Photo: Sk.ru. Currently, it is not uncommon for Russians who can afford to do so to seek treatment for serious conditions such as cancer in countries with an excellent reputation for healthcare, such as Israel and Germany. The MMMK is aimed at providing that same level of healthcare within Russia itself, and doctors there will be able to legally use medicines that are not yet available in the rest of Russia, but which have been approved for use by any of the 36 member countries of the Organisation for Economic Co-operation and Development. Moscow Mayor Sergei Sobyanin speaking at the official opening of the clinic on Wednesday. Photo: Sk.ru. “It’s very important that those Russians who currently go to Germany or Israel for medical help won’t have to get on a plane and pay for accommodation ... here at Skolkovo they will get quality medical help that previously they could only have got abroad,” said Sobyanin, adding that it was important not only for Moscow and Muscovites, but for the country as a whole. The Israeli clinic will employ consultants who specialise in diagnosing 50 areas of health conditions, including cardiology, gynecology, oncology and neurology, and is equipped with the latest MRI, CT scan, ultrasound and X-ray machines. The Russian doctors employed there will have the opportunity to go to Israel for training, and the clinic is home to a spacious conference room where medical conferences and seminars and educational programmes will be held for doctors from all across Russia. Medical records at the clinic will be kept in an electronic format. Professor Zeev Rotstein, director general of Hadassah Medical Organisation, said he hoped that patients who have been treated at the Hadassah clinic would leave smiling and return to their normal lives. Photo: Sk.ru. 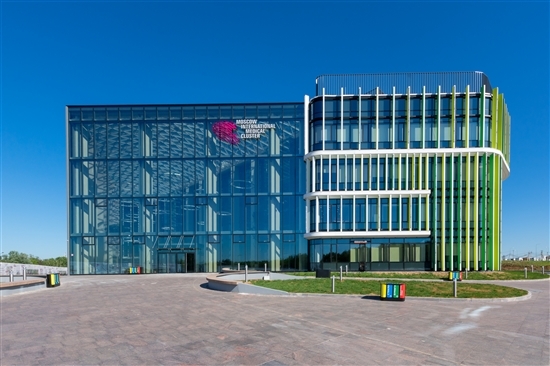 Hadassah Medical Skolkovo is the first facility to open at the MMMK, and the Moscow government stepped up as the investor in the construction of a four-storey building covering over 10,000 square metres. 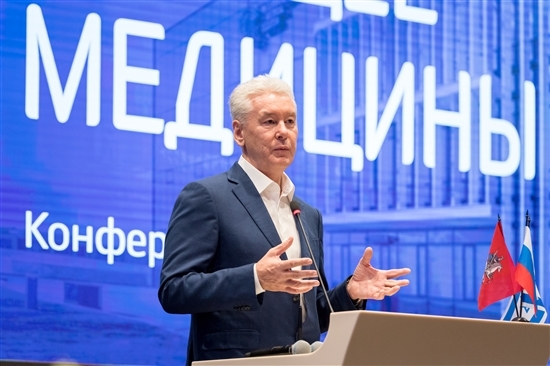 Sobyanin said that planning work on the next major treatment centre at the MMMK is now coming to a close, and that the city already has several potential investors for it. In 2021, a branch of Seoul National University Bundang Hospital is due to open at the cluster. Spain’s Roman Fernandez clinic is also expected to sign an agreement with the cluster on setting up a cancer centre there, according to the Moscow Mayor website. 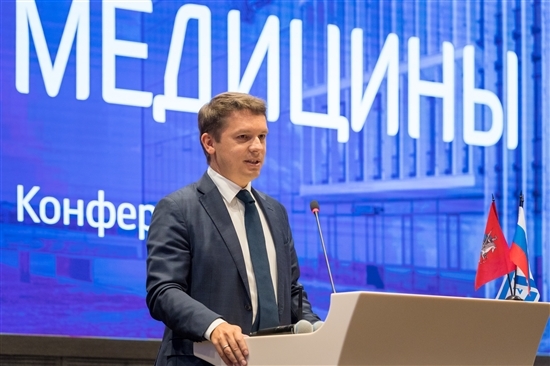 Up to 15 clinics could be built at the cluster, Skolkovo’s senior vice president for innovations, Kirill Kaem, said back in 2016. “We will work together with the physicians of Moscow and Russia to bring better results for Russian people,” said Rotstein. The clinic is equipped with state-of-the-art diagnosis equipment, including MRI and CT machines. Photo: Sk.ru. “Israel is a very small country, but we talk a lot about innovation and medical innovation there, and we come ahead even of the giants. We are thrilled to work together with Russia in a centre that is dedicated to innovation and hi-tech development and facilities for treating the people of Moscow,” he said. “My dream is to see people who, after passing through this centre, are smiling again and going back to normal life. This is our mission, and together with the city and the mayor … I hope to accomplish it, for the people of Moscow and Russia,” said Rotstein, adding that he hoped that people would also come for treatment at the centre from abroad. Igor Drozdov, chairman of the board of the Skolkovo Foundation, said he hoped that the Hadassah clinic would make use of the resources of the Skolkovo Technopark's resident startups working in biomed. Photo: Sk.ru. Igor Drozdov, chairman of the board of the Skolkovo Foundation, said the opening of the Hadassah clinic was a major event for both Moscow and the Skolkovo innovations city, and expressed hope that the MMMK and the Skolkovo Foundation’s biomed cluster would work together on research into new drugs and medical equipment. 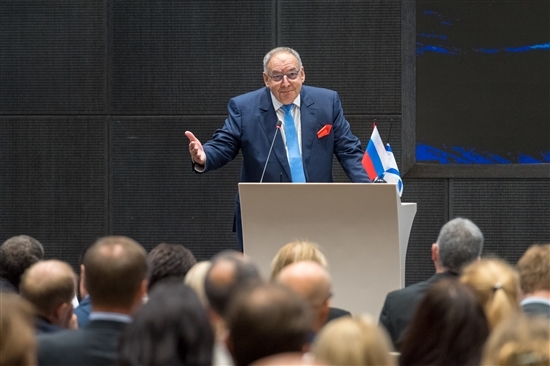 “I really hope that the people working in the Hadassah clinic will make use of the potential located just a few hundred metres away, in the Skolkovo Technopark, where several dozen startups are working whose products are in demand both in Russia and abroad: I hope their products will be in demand at this clinic too,” said Drozdov. 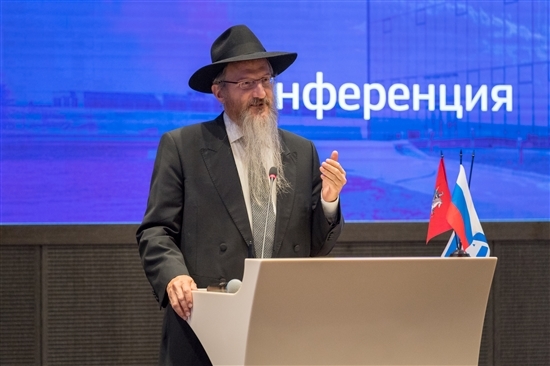 Berel Lazar, Russia’s chief rabbi, said cooperation between Russia and Israel would save lives. Photo: Sk.ru. Technology invented by one Skolkovo resident is already present in the MMMK: Eidos-Medicine makes surgery simulators for training medical students and allowing experienced surgeons to practise for complicated operations, and its machines are part of the state-of-the-art range of equipment that the Hadassah centre boasts. As part of Wednesday’s opening ceremony, Hadassah Medical Skolkovo also signed agreements with AstraZeneca, Siemens and PENTAX Medical: all partner companies of the Skolkovo Foundation. Also present at the Hadassah clinic’s opening Wednesday were Israeli ambassador Gary Koren and Berel Lazar, Russia’s chief rabbi, who reminded those present of the Jewish teaching that a person who saves a life saves the whole world.